New Year, New Series: Winter Sonata 1-4 released! We thought we’d start the year off right by introducing a new series. So, without further ado and together with our friends at Frostii, we bring you Winter Sonata. Our dedicated team has slaved for the last week to bring you not 1, not 2, but 4, yes 4, episodes to begin your new year! 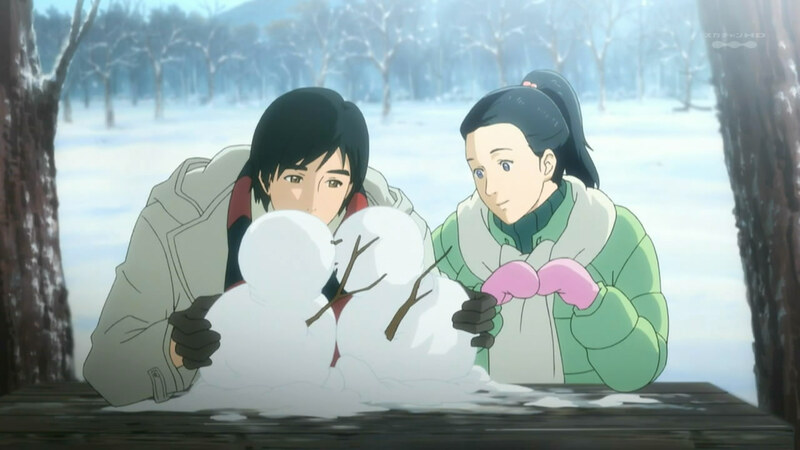 As many of you may know, the Winter Sonata anime began broadcasting in October and is based on the wildly successful K-drama that was popular in Japan about 10 years ago. What you may not know is that the anime is voiced, in Korean, by the original K-drama actors. As mentioned above, this anime is entirely in Korean. It was broadcast with Japanese subtitles, which we cannot (unfortunately) remove. We have the pleasure of working with some great high quality raws (the original transport streams in fact) so we can confirm that these subtitles are not optional; they are part of the video itself and cannot, therefore, be removed. While this may sound like a problem, I would like to assure you that it is not. We have placed the English subtitles directly below the Japanese ones, and our staff have reported that after a few minutes they forget that the Japanese is even present. Those of you who can read Japanese will notice that the Japanese and English subtitles do not always agree. Even those of you who do not will notice that we often have longer subtitles, and that there are more total subtitles in English than in Japanese. There is an excellent reason for this: our translation has been taken directly from the Korean audio. We are blessed with a professional level translator who is fluent in both Korean and Japanese and he has pointed out that the translator for the Japanese subtitles was, well, lazy. While the Japanese subtitles get the point across, they are not always accurate. We hope that you will, therefore, enjoy watching the show as it was intended to be understood. Korean is a pain to romanize. I can not make it any clearer than that. There are multiple possible ways of spelling every Korean word. Therefore, we have chosen to spell names according to what we believe is easiest to read in a subtitle. Depending on what translation of the K-drama you may have watched, our spelling of the names may differ. So, for everyone who ever enjoyed Winter Sonata, and for everyone discovering it for the first time, enjoy! From where did you get the TS Raw? I thought SFW is the only group having a raw provider for the PPV chan? Please release the raw it would help a lot of groups waiting for subbing it into another languages! Thanks! Oh! Thank you so much! Your release is just the best I have seen and with really quality and accuracy! And have a good year! Thank you very much for release! Awesome, SFW-subs seems to have dropped this and I’ve really been looking forward to continue wathcing it. Please, release the raw! SFW did not and you? You’re better than SFW… Make it possible for every group wanting to sub such a great anime with a HQ RAW, please!!! We will not be releasing any of the raws. Sorry. This is our group policy and non-negotiable. Even if we wanted to, at 3gb apiece it’s not worth our time, effort, or bandwidth. This is GREAT! i had been waiting for the subs for ep 5 for weeks! Thanks so much! Hope you keep them coming!